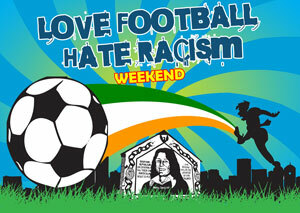 A FESTIVAL of football, ‘Love Football – Hate Racism’, kicks off 7.30pm Friday 31 July at McEnaney’s Bar with an open forum, ‘How can we combat racism in sport?’ Chaired by Michael Culbert (former Antrim and St Gall’s football manager), the panel includes Ireland’s foremost anti-racism and sports campaigner Frank Buckley (co-founder of SARI – Sports Against Racism Ireland), ex-ANC member now living in Ireland Patrick Maphoso, who is now head of the African School Sports Association, as well as supporters’ reps from AC Milan, FC St Pauli, and Sport Under Siege (Milan), among others. The event starts with a showing of a short film SARI commissioned on racism recently shown on Setanta Sports TV. The forum will be followed by a ‘Love Music – Hate Racism’ gig featuring the Number 1 Clash tribute band, London Calling, giving fans of The Clash a chance to show off their pogoing skills. This will be a great night of classic Clash tunes being belted out in Belfast for the first time in many a year. Tickets available at the door at the venue, McEnaney’s. Playing on Saturday (1 August) at the Grosvenor Recreation Centre from 9:30am, this footiefest has over 16 teams from Italy, the Philippines, Poland, Scotland and local teams and cross-community teams. The two teams making the final will come together to form a team to take on the top African All Stars teams in a fiercely-contested challenge match for the Respect Trophy. And to add to the festival fun, as part of the multicultural day, a celebration of local ethnic communities, there will be dance and Filipino hospitality as well as a spit-roasted pig along with other culinary delights! As part of this weekends festival ‘Love Football – Hate Racism’ in Belfast, local sports people clubs and activists have teamed up with the African Schools Sports Association to appeal for people to donate any old soccer, GAA or other sports kit (shirts, shorts, footballs, training tops, tracksuits – whatever you can spare) to help spread sport in Africa. Donations can be made to the tournament organisers on Saturday or any Sinn Féin office.